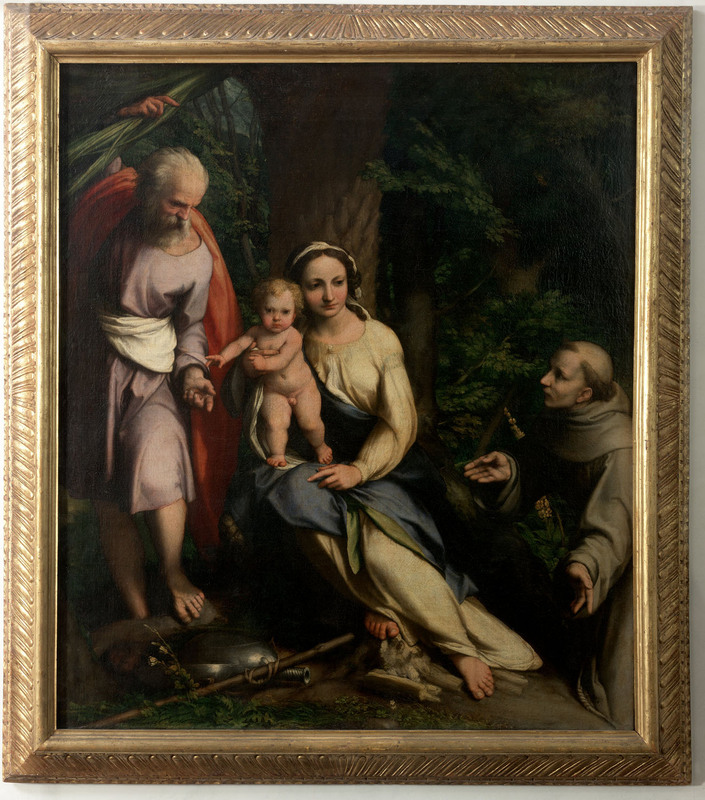 Rest on the Flight into Egypt with St. Francis was commissioned in 1520 ca. by jurist Francesco Munari – affluent jurist and a man of great culture – for the family chapel of the Immaculate Conception in the Church of St. Francis in Correggio. For this small altarpiece, Correggio – the most important Renaissance painter of the school of Parma – draws inspiration from a miraculous episode narrated in the apocryphal gospel of pseudo-Matthew: Mary stopped to rest under a date palm and, seeing it full of fruits, she asked Joseph to pick some. However, considering the fruits were too high to reach, Joseph replied they should rather think about finding some water. Jesus then asked the palm to bend its branches so they could refresh themselves with its fruits, and at its roots there appeared a spring of clear water. Correggio paints the moment when Joseph, still holding a branch, offers Jesus some fruits. The intimate dimension of the event is rendered in the serenity of affections within the family group in everyday life, amidst luxuriant natural surroundings (in this case the welcoming shade of the palm tree and of the oak grove). Correggio’s style merges Leonardo’s expression of the variety of affections with Raphael’s classical harmony. The Child, standing on Mary’s knees, holds out his hand to take the fruits, but his intense gaze is turned towards the observer. The Virgin, universal mediatrix, is seated under the palm tree and looks to her left towards Saint Francis including him in the life of the group, though chronologically extraneous to the narrative. Its presence is justified both as the namesake saint of the patron, Francesco Munari, and for the church designation, belonging to the Franciscan Order. The iconographic choice of this narrative theme for an altarpiece is infrequent, and it can seem unrelated to the Immaculate Conception to whom the chapel is dedicated. In reality, through the symbolism of the palm that has a central position in the painting (at least until the Seicento it was in fact known as “Madonna of the Palm Tree”) the Rest on the Flight into Egypt is strictly related to this theme. The palm was considered a symbol associated with the Virgin Mary by virtue of a verse in the Song of Songs (7, 8): “your stature is like that of a palm tree, and your breasts like its clusters of fruit”. It is also emblematic of martyrdom and glory, referable to Jesus. The palm buries its roots in the purest water, it never dries up and it provides shelter: it represents perennial life, virginity, maternity, and therefore the Immaculate Conception of Mary. The work, sold by the Franciscan friars to duke Francesco d’Este in 1638, was acquired soon afterwards by grand duke Ferdinando II de’ Medici in exchange for the Sacrifice of Isaac by Andrea del Sarto (now in Dresden). The small altarpiece immediately hung in the Tribuna of the Uffizi, among the masterpieces of the Medici collections.